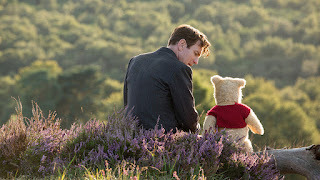 Before I saw it I wasn't quite sure what to think of CHRISTOPHER ROBIN (2018), as the computerized Pooh and friends seen in the trailer looked more than a little odd. 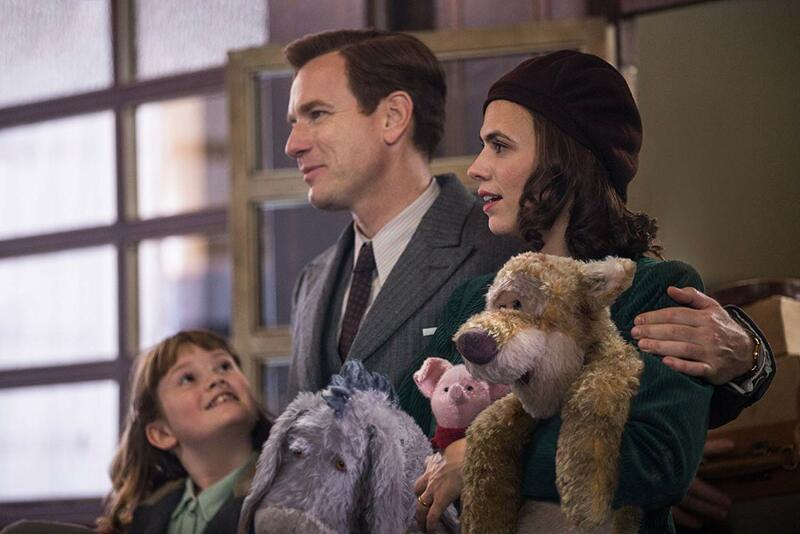 Three things pulled me to try the movie: Hayley Atwell of AGENT CARTER (2015) and CINDERELLA (2015) playing Christopher Robin's wife; knowing that the film used Disney's Sherman Brothers Pooh songs and that Sterling Holloway's successor as Pooh's voice, Jim Cummings, continued to play him here; and my general love for Winnie the Pooh. The endorsement of Leonard Maltin didn't hurt either! 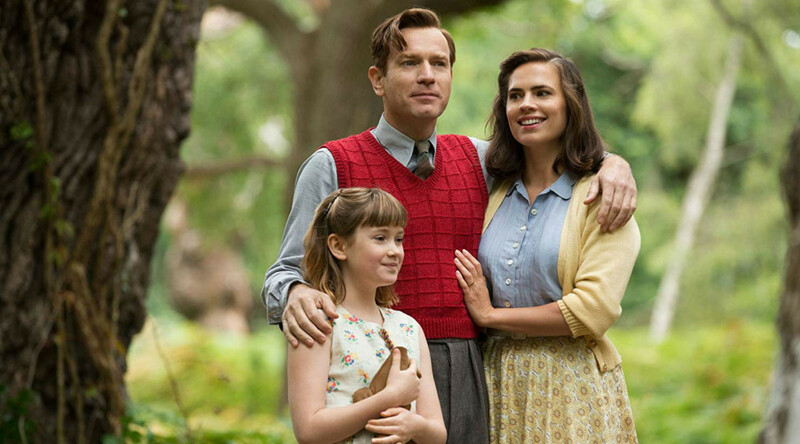 CHRISTOPHER ROBIN tells a simple story: The adult Christopher Robin (Ewan McGregor) is stressed by the pressures of his job at a luggage company and has been gradually losing touch with the most important people in his life, his wife Evelyn (Atwell) and their daughter Madeline (Bronte Carmichael). 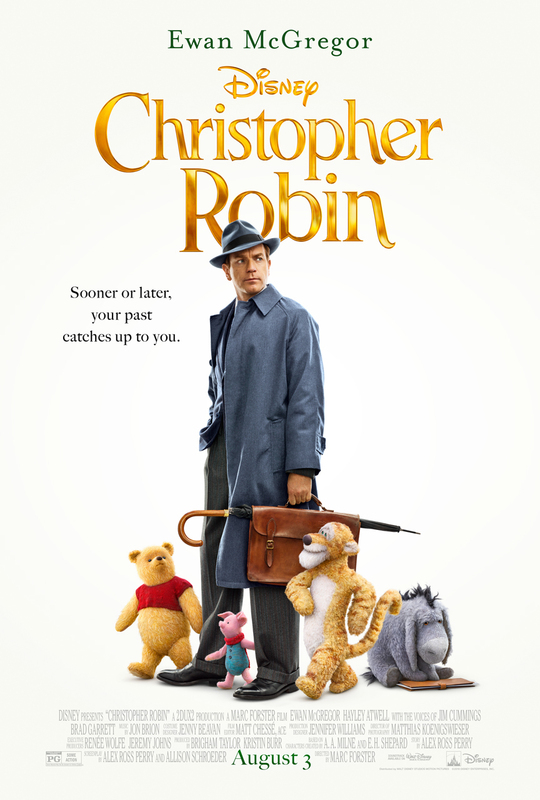 One day Christopher unexpectedly meets up with his old friend Pooh (Cummings) in a park and suddenly finds himself on an adventure to return Pooh to the Hundred Acre Wood and locate Pooh's missing friends. Along the way Christopher's childhood animal friends remind him of what's truly important in life. I was a bit iffy during the opening sequence with Christopher as a child (Orton O'Brien), which I found slightly too mawkish, but the film improves as it goes. The computerized characters gradually grew on me, as they were perfectly voiced; Brad Garrett made an excellent Eeyore, and Cummings voiced Tigger with slightly Paul Winchell-esque overtones, along with voicing Pooh. Their dialogue was pitch perfect, both funny and incisive. McGregor convinces us that it's perfectly natural to be holding a conversation with Pooh, which is particularly something considering he was acting opposite characters who weren't really there! Atwell does her typically good job in a smaller role as the exasperated wife, and Carmichael is quite natural as their daughter. One of the film's pleasures is its use of the Sherman Brothers music, both subtly in the background and occasionally front and center, as in the wonderful moment when Tigger launches into "The Wonderful Thing About Tiggers." I loved this connection to Disney's earlier Pooh films; be sure to stay for the end credits and a special treat with Richard Sherman. Speaking of connections to earlier Disney, the sequence near the end with the company board reminded me just a bit of Mr. Banks and the bank directors meeting in MARY POPPINS (1964)! I liked Oliver Ford Davies as the company head, though I found Christopher's boss Giles (Mark Gatiss) too much of a caricature. There's never any suspense about where the film is going, but there's quite a bit of pleasure in the journey. All in all, CHRISTOPHER ROBIN's more predictable aspects make it not quite a great film, but its heart and originality, daring to present Pooh and Company in the "real world," make it a very good one. It's a warm, soothing, and occasionally rib-tickling film. 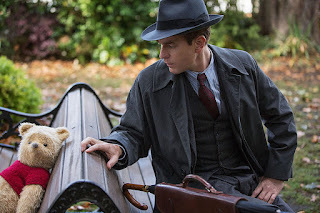 CHRISTOPHER ROBIN was directed by Marc Forster and filmed by Matthias Koenigswieser. The running time is a well-paced 104 minutes. Related review: THE MANY ADVENTURES OF WINNIE THE POOH (1977). Finally, one of my occasional notes on the current state of moviegoing: As some readers may know from recent news coverage, the MoviePass service I've enjoyed for the past eight months, allowing subscribers to see a movie a day for $9.95 per month, has been struggling for survival this month. This was no surprise, really, as I wrote back in November 2017 I didn't see how the company could sustain its pricing over the long term; consequently I only signed up month to month, rather than risking paying for a long-term plan. MoviePass is now retrenching with a new three-movie-a-month plan which seems to make considerably more financial sense. Whether they can make it over the long haul is anyone's guess, as at times this month the company has seemed likely to fold any minute. 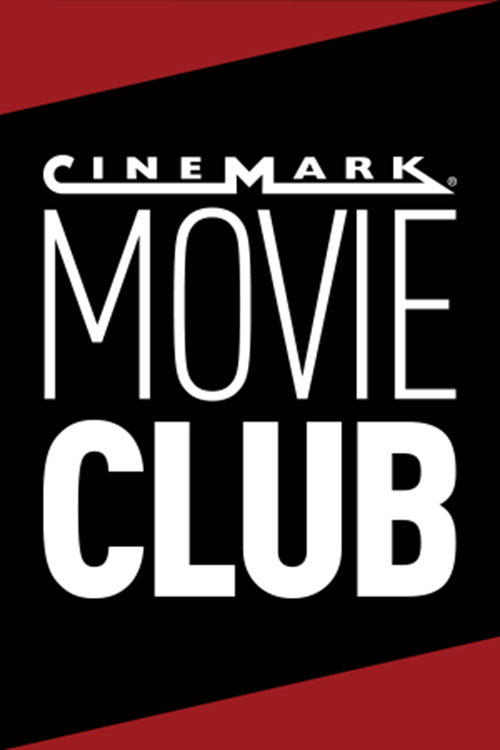 When MoviePass became unusable two weekends ago, along with introducing "surge pricing" (rescinded under the latest plan), and also announced to subscribers via email that they would be cutting back on customer service, I decided it was time to move on and cancelled my subscription; instead I've joined Cinemark Movie Club. It's nowhere near the deal that MoviePass was, but that wasn't even sustainable for MoviePass (! ), and since the two theaters I visit most often for "new" movies are in the Cinemark chain I will definitely benefit. I was so uncertain that I was going to wait for my daughter to give me her thoughts on whether or not I should make the effort to see it, but I read enough positive things I decided to take the plunge since I had the time today -- and it was Discount Day at the theater! LOL. I just added a link to an article on the film's meaning for adults which I thought made some very good points and may further encourage you. I've been thinking about the movie since I saw it earlier today and the more I think about it, the more I'd like to see it again -- always a good thing! If you see it please do let us know your opinion. Very interested to read your review of this film, Laura, as I booked tickets just today for my wife and myself to see it. We both have reservations though your view of it has given me considerable encouragement. Whether it can measure up to the "PADDINGTON" and "PADDINGTON 2" films remains to be seen (as they were utterly delightful and funny). I'll call back with some thoughts, if I may. It's good that they at least kept a resemblance to Paul Winchell's voice--- I can't think of him without remembering him with his puppets, and of course, Scrubbing Bubbles. The first time I saw a trailer for Christopher Robin I marked it "pass". However, as time went on I found myself revising that to "maybe". You have pushed me over the edge. Jerry and Caftan Woman, I will be very interested to hear what you think. Hopefully I'm not an "outlier" and you will enjoy it also! Either way I'd appreciate you sharing your thoughts! Jerry, I've yet to see the PADDINGTON films, though I grew up loving the books -- precisely because the computerized characters weirded me out LOL. Now that I've enjoyed this film perhaps I should try them. I've especially heard good things about PADDINGTON 2. Both are such fun, Laura, and "PADDINGTON 2" even more.